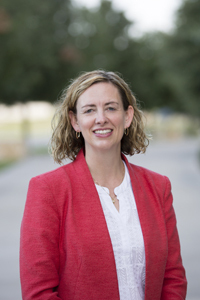 Baylor>Department of Religion>Our Faculty>Faculty>Deirdre Fulton, Ph.D.
Ph.D., Pennsylvania State University, History and Classics and Ancient Mediterranean Studies. Deirdre Fulton specializes in the history, literature, and archaeology of the late Iron II through Hellenistic periods. Deirdre Fulton joined the Department of Religion at Baylor University in the fall semester 2013. Her area of research focuses on the Persian Period, specifically the books of Chronicles, Ezra, and Nehemiah. Fulton is also interested in zooarchaeological related research, connecting text and artifact. She is involved in several ongoing excavations in Israel, including the Leon Levy Ashkelon Excavations, Tel Shimron Excavations, and also the Jezreel Valley Regional Project. Her interest in archaeology helps inform questions related to diet, sacrifice, and economy. Deirdre is a member of the Steering committees on Literature and History of the Persian period for the Society of Biblical Literature and the Feasting and Foodways for the American Schools of Oriental Research. She is also a member of the Catholic Biblical Association and American Institute of Archaeology. She is married to James Fulton, a Geochemist in the Department of Geology. D. N. Fulton. Reconsidering Nehemiah’s Judah: The Case of MT and LXX Nehemiah 11-12. Forschungen zum Alten Testament II, 80. Tübingen: Mohr Siebeck; 2015. Pp. 258+xv. G. Knoppers, L. Grabbe, with Deirdre Fulton (Eds.). Exile and Restoration Revisited: Essays in Memory of Peter R. Ackroyd. Library of Second Temple 73. London/New York: T & T Clark Continuum; 2009. Pp. 225 + xi. D. N. Fulton, Y. Gadot, A. Kleinman, L. Freud, O. Lernau, and O. Lipschits. “Feasting at the Edifice of Ramat Rahel.” Bulletin of the American Schools of Oriental Research, 374 (2015): 29-48. D. N. Fulton, "Where did the Judeans, Benjaminites, and Levites Settle? Revisiting the Text of MT and LXX Nehemiah 11:25-36" in New Perspectives on Ezra-Nehemiah Story and History, Literature and Interpretation, ed. I. Kalimi. Winona Lake, IN: Eisenbrauns, 2012. D. N. Fulton, "What do Priests and Kings Have in Common? Priestly and Royal Succession Narratives in the Achaemenid Era." Pp. 225-41 in Judah and the Judeans in the Achaemenid Era: Negotiating Identity in an International Context, Eds. G. Knoppers, O. Lipschits, M. Oeming. Winona Lake, IN: Eisenbrauns, 2011. D. N. Fulton and G. Knoppers, "Lower Criticism and Higher Criticism: The Case of 1 Esdras." Pp. 11-30 in Was First Esdras First? Investigations into the Priority of First Esdras, Ed. L. Fried. Atlanta: Society of Biblical Literature, 2011. B. Hesse, D. N. Fulton, and P. Wapnish, "Animal Production and Bone Debris at Ashkelon in the Seventh Century BCE." Pp. 615-644 in Ashkelon 3: The Seventh Century B.C., Ed. L. Stager and D. Master. Winona Lake, IN: Harvard Semitic Museum/Eisenbrauns, 2011. D. N. Fulton, "Jeshua's "High Priestly" Lineage? A Reassessment of Nehemiah 12:10-11." Pp. 94-115 in Exile and Restoration Revisited: Essays in Memory of Peter R. Ackroyd, Eds. G. Knoppers, L. Grabbe, with D. N. Fulton. Library of Second Temple 73. London/New York: T & T Clark Continuum, 2009. View Dr. Fulton's CV here.